In the eighteen months I’ve been scouring the Op Shops of Sydney for second hand vinyl I’ve not come across much Krautrock. So why did finding this debut solo album from Michael Rother for $1 leave me with mixed emotions today? Not because it isn’t great. 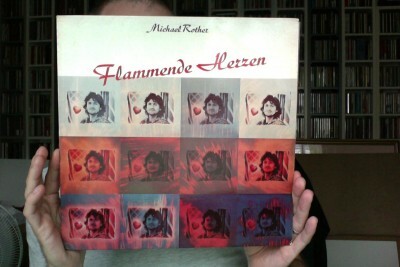 Flammende Herzenn (trans: Flaming Heart) was recorded in 1976 in between the second and third Harmonia albums and after Rother had spent time (very briefly) in Kraftwerk and, more pivotally, Neu! His Kosmiche pedigree is second to none and this album is up there with the best of his work. Produced by the equally legendary Conny Plank, it’s entirely instrumental with Rother playing nearly everything on the album, his guitar and keyboard work instantly recognisable – the only other credited musician is Can‘s Jaki Liebzeit on drums ( or “Schlagzeug” as it says on the cover. Yes it’s the original German Sky label issue). Rother. Plank. Liebzeit. Now that’s a recipe for something special. No, the reason I’m feeling a little less than elated is I can’t help but think that whoever originally owned this also owned some other equally great Kosmiche music and someone must have beaten me to those records at Vinnies. Why they missed this one, I don’t know but I’m grateful they did – although I’m also thinking “what if I’d got there a bit earlier?”. First world problems, eh? or if you just want to try a little dip, here’s track 3 ‘Feuerland’ on YouTube. This entry was posted in Adventures in Op Shops, Vinyl and tagged Krautrock, Op Shop, Vinyl by nickpeters. Bookmark the permalink.